Home / GADGET / LIFESTYLES / TRAVELOGUE MALAYSIA / SPECIAL SATURDAY ALERT! GET 1 FOR 1 MOVIE TICKETS AT TGV CINEMAS WITH YOUR TOUCH ‘N GO eWALLET! SPECIAL SATURDAY ALERT! GET 1 FOR 1 MOVIE TICKETS AT TGV CINEMAS WITH YOUR TOUCH ‘N GO eWALLET! Are you heading out to the movies this weekend? Touch ‘n Go eWallet and TGV Cinemas teamed up to bring you an exclusive promotion, perfect for weekend movie dates across all TGV Cinemas nationwide! 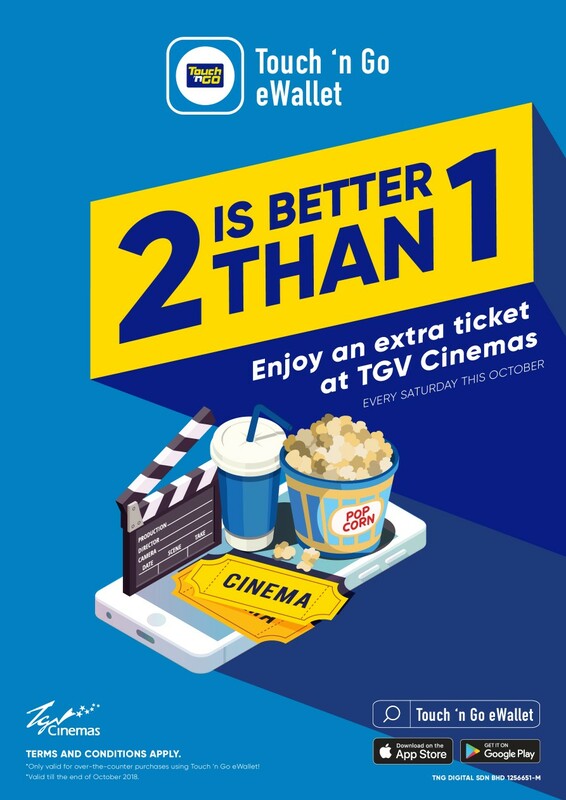 For every Saturday throughout the month of October, enjoy the “Get 1-for-1 Movie Tickets” promotion when you make over-the-counter purchases at TGV Cinemas with your Touch ‘n Go eWallet. The promotion begins this Saturday, 6 October. So, make your way to TGV Cinemas now and secure yourself a pair of movie tickets to catch all the upcoming blockbusters! 1. Download the Touch ‘n Go eWallet from the Apple App Store or Google Play Store. 2. Reload your Touch ‘n Go eWallet. 3. The promotion is valid every Saturday throughout the month of October (6/10, 13/10, 20/10, 27/10), while stocks last. 4. Only applicable for over-the-counter purchases at TGV Cinemas made with the Touch ‘n Go eWallet. 5. Only applicable for showtimes on Saturdays in the month of October. 6. Only applicable to standard and preferred seat tickets. Check out ​www.tngdigital.com.my​for more information.